Laguna appeared on the verge of a stunning victory against league-title favorite Costa Mesa with only minutes remaining. 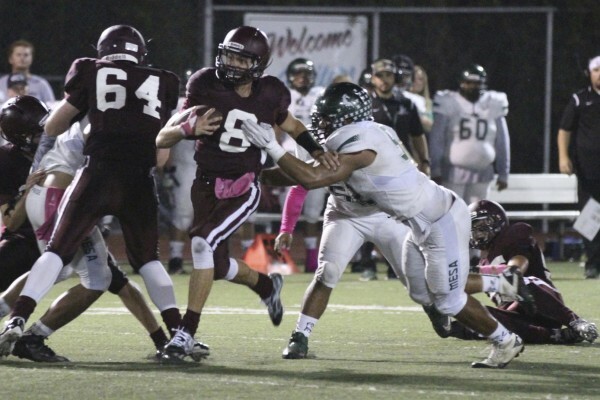 With under five minutes remaining in the contest, a hard hit on running back George Cracknall caused the ball to pop into the arms of Mustang tackle Angel Valley, who ran 29 yards to set up the winning score for Costa Mesa. The stunning momentum swing dashed a hard fought Laguna comeback in the second half that featured stopping Mesa on downs followed by three consecutive turnovers from Costa Mesa before the winning drive from the one-yard line. The game opened with both teams trading possessions until midway in the second period when Costa Mesa successfully ran 58 yards on eight plays to score. A two-point conversion run made it 8-0 with barely three minutes remaining in the half. Laguna responded with their own march, going 57 yards to the Mesa five yard line before settling on a 22-yard Cracknall field goal with 18 seconds remaining. In the second half, Laguna opened with a strong 46-yard drive but an end-zone interception saved Mesa from the threat. Mesa nine-play possession was stopped on downs followed by Laguna’s failure to generate yards on a seven play possession as the third period ended. The fourth quarter began with three consecutive turnovers. Mesa lost the ball after a nine-yard run recovered by George Cracknall. Breakers turned around and lost the ball when a Jack Simon to Matt Hayes pass play was bobbled into the hands of a Mesa defensive back who returned the gift 14 yards. Finally after a short run and a dead-ball penalty, the Breakers sacked the Mesa quarterback and recovered the ensuing fumble on the Mesa 25. Another Mesa penalty set the Breakers up for a quick 20-yard drive and the go-ahead score. Costa Mesa’s next try with the ball was a long seven-play drive that ended on Adam Armstrong’s third interception of the season. On the very next play the ball popped and Laguna’s chances were dashed. The home team did get the ball for one last try but their 10-play possession never really threatened as five long pass attempts were incomplete. Up next is Saddleback (3-3) in a Friday, Oct. 16 at Segerstrom High School followed by Laguna’s 60th Homecoming Game on Oct. 19 with Estancia. No. 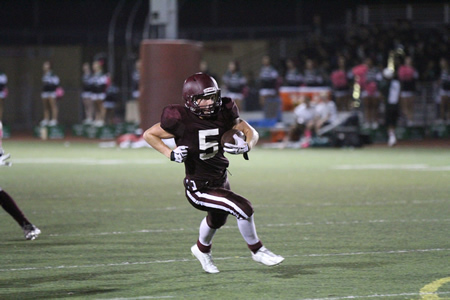 5 George Cracknell had a standout game against Costa Mesa. Jack Simon is now # 8 in career Total Offense with 3,294 yards.